Polish Pickup Pack is coming up soon and so I have a polish to show you that will be available only from May 4 through 7! The theme for May is 90s and CrowsToes Nail Color Under Our Tree is inspired by one of my favorite movies from that decade: Forrest Gump. Under Our Tree will be $12, and there will be no cap (or limit) to how many polishes are available. 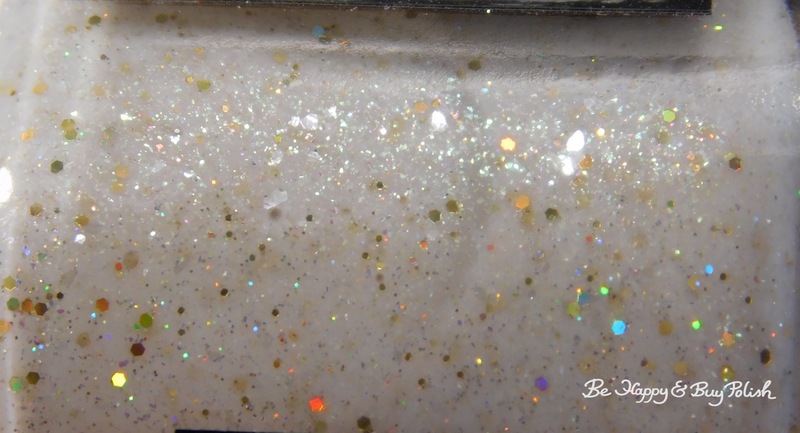 Under Our Tree is a soft and delicate bone tinted crelly polish with assorted sparkles and shifting shimmers. Formula may be a little thick for some, but I prefer a thicker polish as usually it goes where you want and doesn’t run around; this was the case here! It isn’t as sheer of a polish as you’d think, but it may dry gritty; hence why I used a matte top coat followed by a shiny top coat. Man, Madame Crow never fails to surprise me. This polish is incredibly ethereal – perfect for May and through the summer for weddings. I really hope you pick this one up! If you’re looking for the official bloggers for this month, look forward to posts from Nichole at Bedlam Beauty and Jenny at Lavish Layerings. Man, this is so pretty! I remember going to see Forrest Gump in the theater and loved it so much. It was sooo different at that time. Do you think the movie has aged well? I’ve seen so much negative criticism of it decades after. I still think it’s beautiful! I haven’t watched it in a few years. It’s one of my parents’ favorite movies too.